If you have a missing or damaged tooth, a crown or bridge may be the solution! Crowns and bridges are great solution if you have a damaged tooth, or if one or more teeth are missing. Both crowns and bridges are fixed in place, and made of natural-looking porcelain, perfectly matched to your teeth! Depending on your specific situation, Dr. Bundalo may recommend either a crown or a bridge. When would I want a porcelain crown? Porcelain crowns are a great solution for many issues. A porcelain crown can be used to restore a damaged tooth, prevent a weak tooth from fracturing, cover a poorly shaped tooth or cover a tooth that has undergone a root canal treatment. 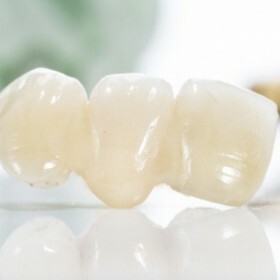 Porcelain crowns are perfectly matched, both in shape and color, to your existing natural teeth. Additionally, porcelain crowns can be attached using dental implants, for a very stable fit. These are referred to as dental implant crowns. When would I want a bridge? In certain circumstances, a dental bridge may be recommending if you are missing one or more teeth. In some cases, you may have the option of a dental implant crown instead of a bridge. Call us to schedule a free consultation with Dr. Bundalo! Can porcelain crowns and bridges help with my bite? Yes! When teeth are missing or misshaped, this can lead to many issues with the jaw and bite. Dr. Bundalo has extensive experience with the masticatory system (bones and muscles of the jaw) and can make recommendations for adjustments that can lead to a better bite, and help with pain and discomfort of the jaw.